So you’re in London and hitting all the must-see attractions, which obviously includes the changing of the guard at Buckingham Palace. You walk excitedly through St. James Park, with the beautiful Palace coming into view in the distance. But as you get closer, you realize that you’re mostly going to get only one view: the backs of people’s heads. Despite the fact that changing of the guard in front of Buckingham Palace is free, it’s also crowded with tourist. Your point-of-view (if you have one at all) is very far from the actual guard and separated by a large wrought iron fence. In our experience, watching the changing of the guard at Buckingham is a lackluster experience and not worth the effort. Fear not, however! There is a much better place in which to get the best view of all those guards in funny hats marching around and making a big show. 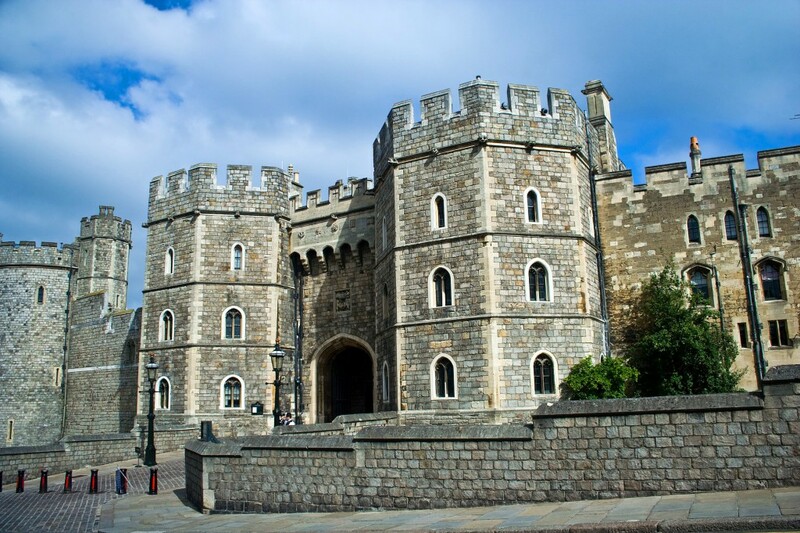 Windsor Castle has been home to the Royal Family for almost 1,000 years. Built by William the Conqueror in 1066, it is the largest and oldest occupied castle in the world. Aside from being a major tourist attraction, it is the Queen’s preferred weekend home. You’ll know the Queen is residing there when the British standard is flying from the flag pole. Windsor is about 22 miles (35 km) east of central London. There are several trains that travel from London to Windsor. Paddington to Windsor: 30 minutes by fast train with an easy platform change at Slough. This First Great Western train makes roughly three journeys per hour. Waterloo to Windsor: This route is direct to Windsor, but takes around 55 minutes. South West Trains run every half-hour on Monday through Saturday, and less regularly on Sundays. Travel from London to Windsor via rail cost between £11 and £14. 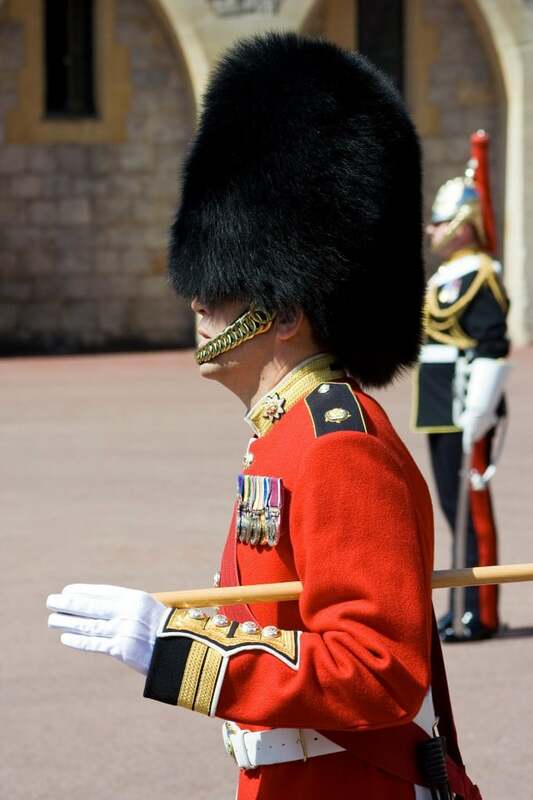 The Changing of the Guard takes place at 11:00 within the Castle grounds Mondays to Saturdays from April until the end of July and on alternate days for the rest of the year, weather permitting. There is no Changing the Guard on Sundays. Be sure to arrive near the Guard Room early to get a good spot. A crowd will begin to form once the ceremony starts, but not nearly as much as you’ll see in front of Buckingham Palace. And unlike Buckingham where you’ll be quite a distance from the ceremony, the spectacle at Windsor Castle is close enough to spit on. 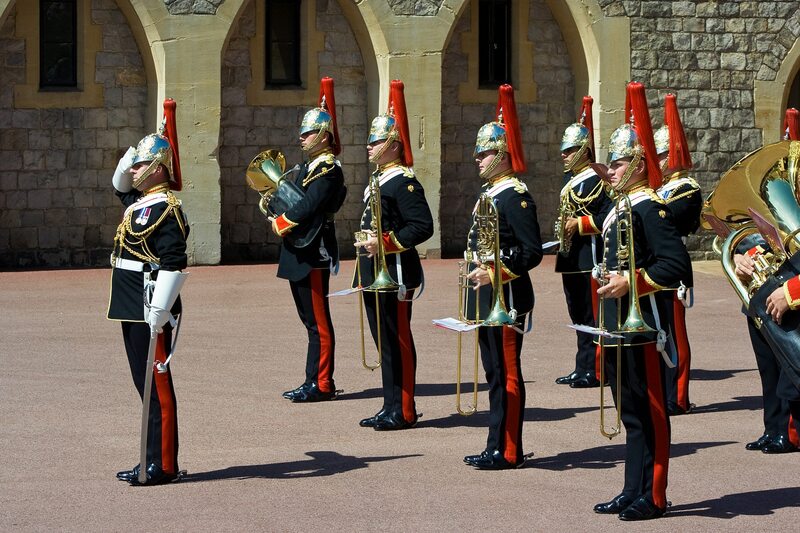 The Changing of the Guard not only includes the handover of duties, but also a presentation by the Regimental Band. The whole ceremony takes about 45 minutes. Plan to spend at least 3 hours at the castle; there’s plenty to see and do. For more information concerning visiting Windsor Castle, including admission prices, times, and directions, visit royalcollection.org.uk.